Only a week after Red Glare VI, we were back in the Highlander trekking to Higgs Farm on Maryland’s Eastern Shore. 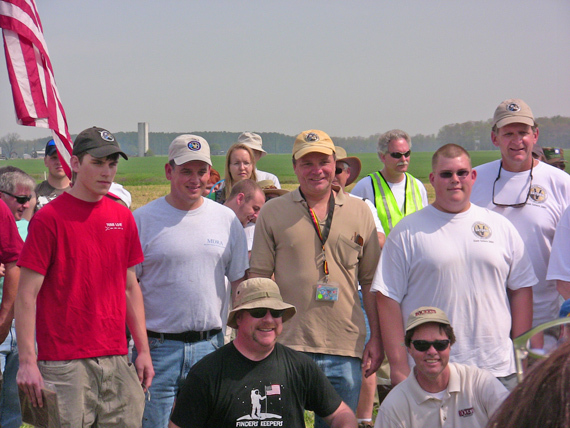 This trek was for Steve Eve’s record breaking attempt at launching his 36-foot, 1648 pound, 1/10 detailed scale Saturn V. Ben and I had a vested interest as we donated one of the eight N3800 motors that will be used in combination with a central P10000 motor that will allow this rocket to fly. 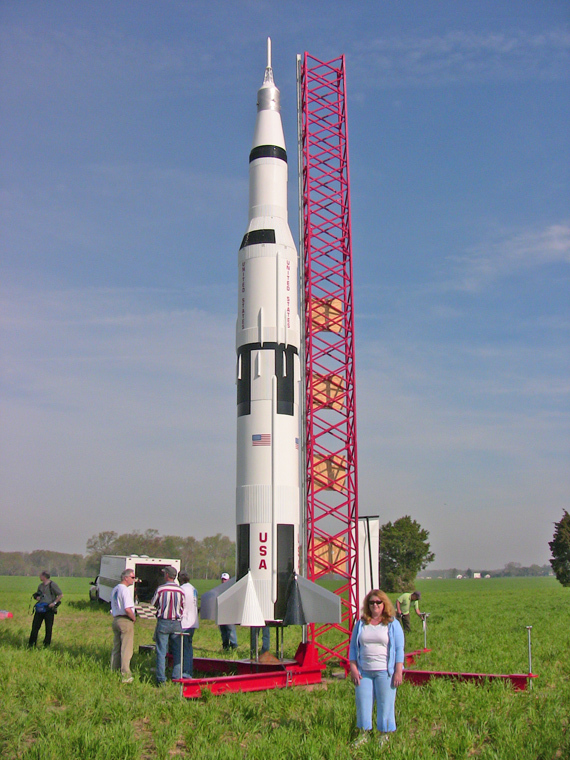 This Saturn V launch is to commemorate the 40th anniversary of the Apollo 11 moon landing. We arrived at the field at 09:00 AM to get our assignments. 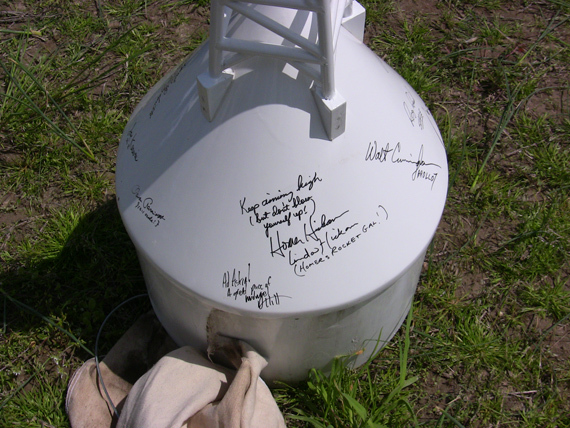 The rocket gods cooperated with this important event and provided us warm temperatures, blue skies, and low winds. The early morning was spent mingling and providing crowd control. The various press was on hand filming and interviewing Steve Eves and various people. Ben and I, with the other motor donors were honored with plaques but nobody cared. The 5000 people in attendance came to see the Saturn V break the world record of the largest amateur rocket launched, in weight and height. The current record holder was MDRA so what did the club have to lose. 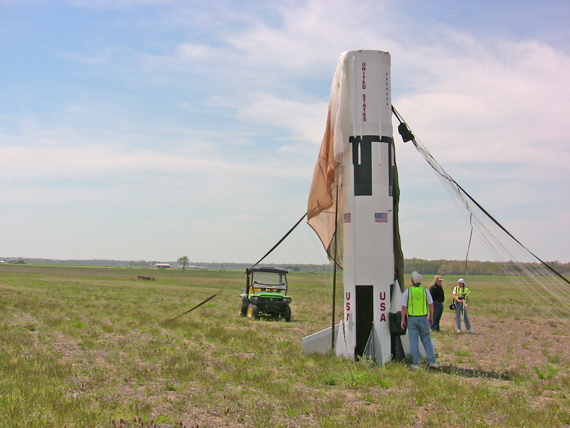 The crowds were pushed backed to 1500 feet for safety and the launching process was started. NASA always launched a Nike Smoke rocket prior to the Saturn V. The purpose of the Nike Smoke rocket was to test and verify the upper winds. This was to be no different and a scaled Nike Smoke was launched to about the same expected altitude as the Saturn V. The parachute was deliberately deployed at apogee and the Nike Smoke’s descent was monitored. The Nike Smoke showed that some winds were blowing aloft. With that out of the way, all focus was on the Saturn V.
A 10-second countdown was given and when the button was pushed, the ground trembled, and a huge plume of fire and smoke push the Saturn V off the pad with great speed. All nine engines lit simultaneously and carried the rocket to 4441 feet. It slowly arced over and parachutes deployed everywhere. The crowd in attendance were on their feet screaming with glee. The rocket slowly descended across the street and safely landed in the field, and stuck the landing! The landing was so gentle that the Saturn V stayed upright. It was a perfect ending to a perfect project. Witness the ultimate world record rocket flight here. It was quite an experience.